It's almost 3 months since the first day I arrived in Istanbul, and I have to say I have done injustice to this special city of so many sights and sounds. Whenever I have a long holiday, I chose to go out of Istanbul and even out of Turkey to explore other European countries. Knowing my exchange here is coming to a close very soon (noooo), I need to spend more time with the city that I live in and actually discover all the things waiting to be discovered! I shall not talk about the usual touristy places like the Hagia Sophia, Blue Mosque or Topkapı Palace because I am sure you can much more detailed information on those places elsewhere. So I decided I should write about the less touristy places of Istanbul that is worth a visit if you have extra time after doing all the touristy stuff, or if you are not a first-time visitor to Istanbul. I'm sure most people who is planning to visit Istanbul will probably know about Taksim. 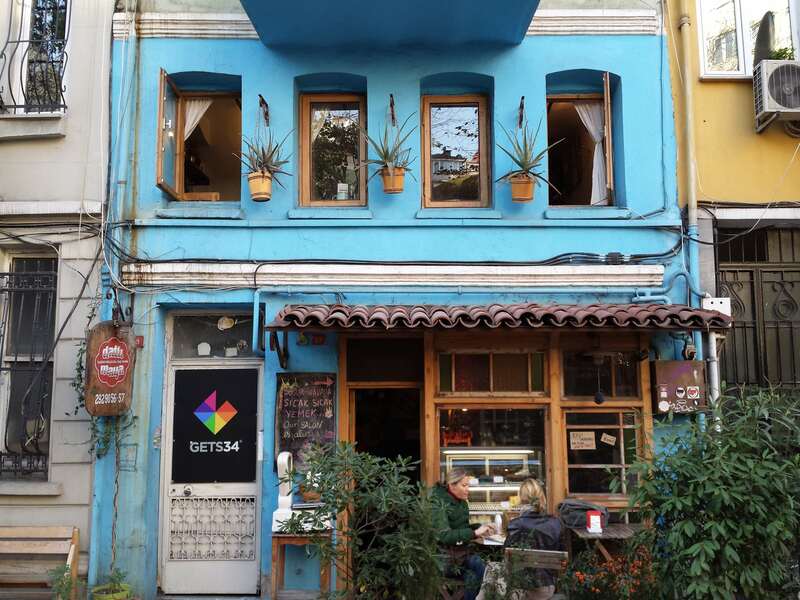 Well, Cihangir is a district in Istanbul that is between Taksim metro and Tophane tram station (locals please correct me if I'm wrong), and contains many quaint cafes, comfy hamams, and many artsy stuff (from antique furniture to art galleries to museums). Based on a recommendation by a friend, we decided to go to this small restaurant called Datlı Maya. They make their dishes from 'ecological produce from fair trade and sustainable sources' and cook many of their stuff from this '80 year old wood-fired oven', and prices are really reasonable for the quality of food served. 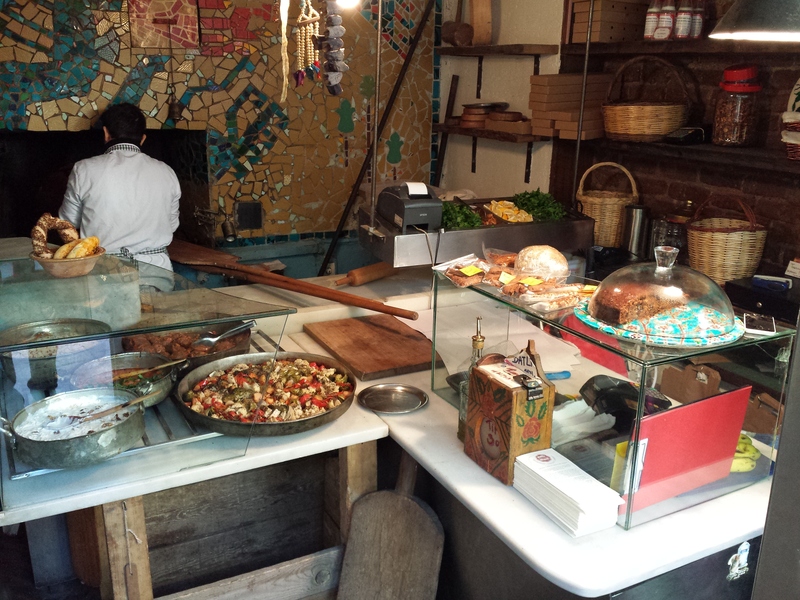 The moment you step into the restaurant, you will be enticed by the smell of the food coming from the oven. The kitchen is very small, but like what the restaurant menu claimed, they do have a 'big heart', and it shows in their food. They do not serve the typical Turkish fare that you will find in a lokantası. 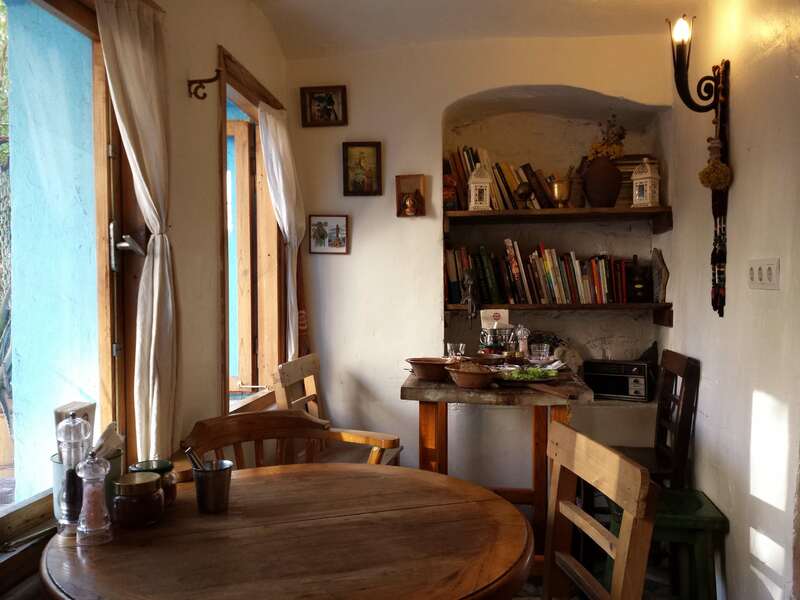 The food here has a very homely feel to it; in fact, the whole restaurant setting is very cozy and welcoming. 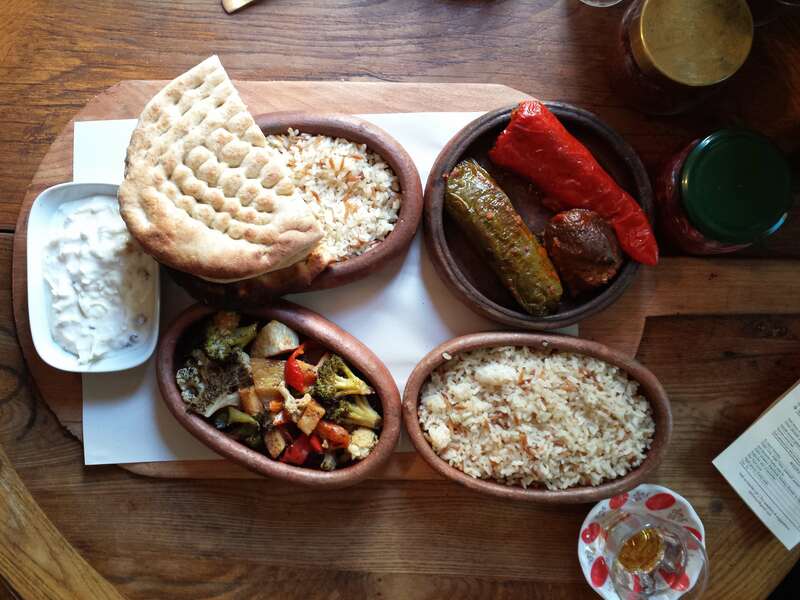 We ordered a portion of mixed vegetables, yoghurt with celery, and peppers stuffed with rice (dolma) each, and two portions of pilaf to go with the dishes. The mixed vegetables consisted of broccoli, cauliflower and some pieces of fruit which I'm not sure what but it tasted like peach, and this was a dish that really surprised me because I could never imagine broccoli and cauliflower to taste this nice! It was nicely seasoned with pepper and other herbs from what I can see and the flavour was really good! So we're off to a good start! The third dish I went for was the yoghurt with celery, and to be honest I hated celery all my life! But after today, I realised that celery can actually taste good too! The yoghurt and celery somehow was able to combine to form this sour yet smooth cooling coselaw-like salad dish and it was really soothing after eating some spicy pickles. The last dish was the stuffed peppers and it was really good, slightly more savoury than the others I had in other lokantası. Not the most special dish I would say, but nonetheless a must try if you are here for the first time. We had çay to go along with our meal (like any other meals in Turkey), and it's like the best çay I've ever had in my whole 3 months in Turkey. It tasted like normal Turkish çay with a hint of winter-melon sweetness, so it was so smooth and easy to drink! I could easily have had 5 cups, but I only had 2. It was only 2 TL for one cup and it was refillable! In total, SW and I spent 50 TL together and we were really full because the portions were generous (especially the pilaf), so I would say that 25 TL/pax for tasty, organic and sustainable fare is perfectly reasonable by Singapore standards. I highly recommend this place for a quiet, cozy lunch. I heard that they serve brilliant breakfast as well, so I'm looking forward to drop by this place again! After a good meal, it's always a good time to relax, and where better to relax than going to a traditional Turkish bath (hamam)? There is one just 7 minutes away from Datlı Maya, known as Ağa Hamamı, and apparently it was used by Mehmed the Conqueror (the Sultan that conquered Constantinople - what we call Istanbul today) as a private bath! I highly recommend this place because of the service provided is worth the amount spent. It costs 50 TL for a typical hamam experience, which includes the entrance fee, scrubbing and foam wash and massage, and 90 TL for the services aforementioned and an additional oil massage at the end. I felt that oil massage is not really very Turkish and I could just do it in Southeast Asia, so I just went for the 50 TL one. So how does the hamam work? Procedures may vary from hamam to hamam, but generally this is how you have a comfortable experience without all the awkwardness of not knowing what's going on! 1. You'll first be brought to a room to undress, and be given a cloth to cover yourself. 2. You'll then be brought to the toilet to relief yourselves, then ushered into the sauna room. 3. Inside the room, there will be the hot stone and washing areas at the sides. The assistant will tell you to rinse yourselves down at the washing areas, then you can feel free to lie on the hot stone to sweat it all out. 4. Around 15 to 30 minutes later, the assistant will call you over and he'll begin to scrub you down with a special scrubbing glove. He'll literally scrub all of your dead skin out, and he might even show you how dirty you actually are! 5. After that he'll ask you to lie on the hot stone and will begin to put tons of foam on your body, and will start giving you a short massage to cleanse your body. 6. Feel free to hang around and relax in the hamam after washing yourselves down. 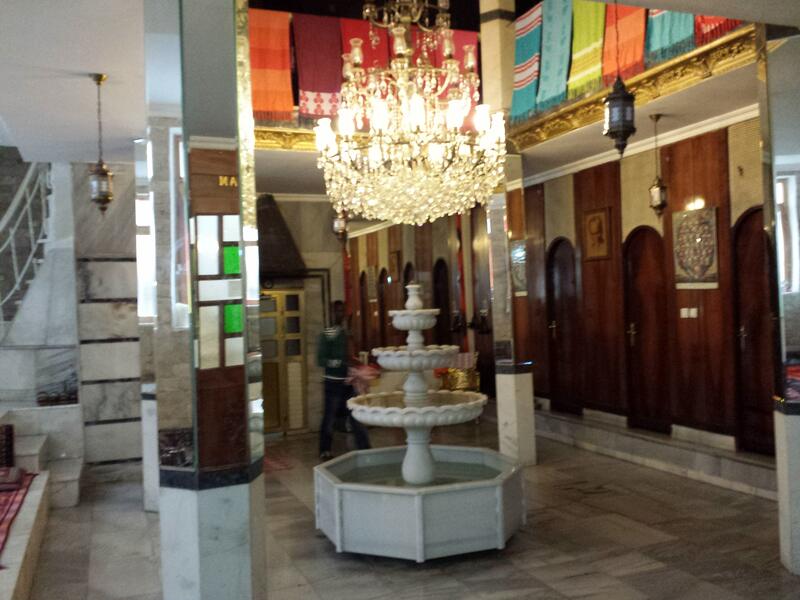 Traditionally, a hamam is a place for locals to socialise, so people usually spend hours inside. Nowadays, people usually spend at least an hour or so to just relax and rejuvenate, so don't rush to get out after you're done! This particular hamam even served us apple tea after the bath and they even had wifi! Super worth it for 50 TL! Other touristy hamams charge at least 90 TL for the same services, so if you want an authentic Turkish bath experience that is also affordable, go to Ağa Hamamı. Istanbul has lots of interesting museums, but the most intriguing one would have to be the Museum of Innocence. Conceptualised by Nobel Prize for Literature winner Orhan Pamuk, he wrote a novel about this guy who likes this girl so much that he always steals one of her possessions every time they met for 7 years. He had the concept of creating this museum that housed all of this possessions at the same time when he started writing the book. It also showcased the history of Istanbul from the 1950s and provided a glimpse of what life was like then. I've never seen any museum of this concept before, so it's definitely worth a visit since it's just within walking distance from the hamam and the restaurant. Unfortunately I couldn't get any photos because it's not allowed inside, so you have to see this place for yourself! Admission fee is 25 TL for adults, and 10 TL for students. Audio guide costs 5 TL, and it's highly recommended, if not you'll just be looking at items with no description inside. Use your feet! Istanbul is best experienced using your own two feet, and even more so in Cihangir! All of the places above are easily reached by walking. It only takes 10 minutes to get to this area from Taksim Square or Tophane tram station, so start exploring! A Singaporean exchange student living in Istanbul. Bringing you local insights of this exotic city from an Asian's perspective.